This is the first Xyz Monster that can Summon Tokens. This is the first WIND-attribute Number. This monster resembles a combination of the Northrop Grumman B-2 Spirit and a Ray. It is also very similar to Mecha Phantom Beast Stealthray; they are both WIND Machine-Type monsters in the combined form of a Stealth Bomber and Ray that Special Summon Tokens. This monster has quite a few similarities with Number 9: Dyson Sphere: they are both Number monsters, both have 3000 DEF, both are Machine-Type, both are space-related megastructures, and both are considerably large in size. Also, for their respective debuts, both monsters were Summoned in a way that involved combining the Levels of their Xyz Materials. Both cards also have Trap Cards specifically designed to work with them, both with negation effects. 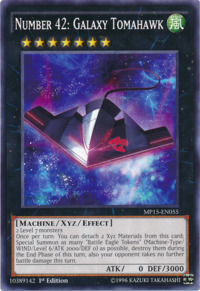 Dyson Sphere has Space Gate which negates the activation of Trap Cards and destroys them, while Starship Galaxy Tomahawk has Tomahawk Cannon which negates attacks from monsters and destroys them. This effect can be activated during Main Phase 2. This effect can also be activated even if the opponent took Battle Damage during the Battle Phase of this turn. Destroying the "Battle Eagle Tokens" during the End Phase does not start a chain.